We got up at dawn. 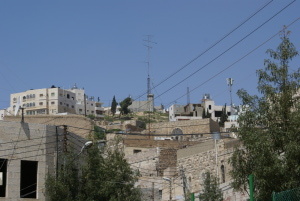 On today’s programme: the town of Hebron, which is a forty-minute-drive from Jerusalem, or about 30 km away from Bethlehem. For Anne-Claire and Tanguy, this means meeting again with Chantal Abu-Eisheh, a Frenchwoman who has settled in Hebron: she welcomed the first Taayoush group in 2009. We have a quick bite to eat then go up the main street of the camp to Road 60 where we can catcxh a bus (in fact a taxi-van). It is still early morning and there is nobody outside except for a sweeper. Today is Sunday, a day of rest for the Christians but not for our young Palestinian friends. Today is yawm al-ahad, literally the first day of the week, a schoolday. Which means our friends can’t come with us to Hebron. Inside the houses of the camp, the children must be slowly waking up. In about an hour time, like every morning, the calls on the microphone will resound in the playground of the Girls’school that is next to our flat. Dressed in dark blue trousers and white and blue petticoats, girls aged 8 to 13 will get in line, sing the morning chant then go into their classroom as quietly as possible. Our steps reverberate in the still empty street. At that moment, we can’t know how much this preludes to the reality we will diqcover a few hours later in Hebron… In front of the closed doors and shutters of almost every house and shop in the camp, there is a cardboard box filled with stale bread. Wasting breadis one of the things that Muslims consider to be haram ("sinful"). Accordingly, they put it in boxes that will be collected and brought to... the animals of the farm-school nearby maybe? This lonely street-sweeper in the early morning, facing all the dust of the streets of the camp… He looks a bit pathetic to us: what can he do against this crumbling road surface and the building rubble that covers part of what are supposed to be sidewalks...? Who is in charge of fixing things in thje camp when they need repairing? Once on Road 60, we hail a first sherout. 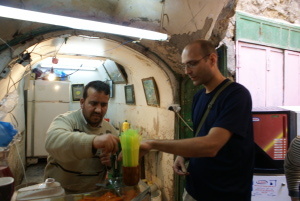 Tanguy agrees on a fare with the driver, then three of us get into it and leave for Hebron. The other four will have to wait quite a while before another taxi can take them all together. We drive through the occupied West Bank. All along the way, we can spot watchtowers, Israeli soldiers on the crossroads and settlements in full expansion... Could the peace process only be a farce? The fact is that the Israeli authorities work at creating “facts on the ground" diligently: « Look, there are hundreds of Jewish Israelis living here: isn’t it obvious that this land belongs to us?... » . Anne-Claire, as she usually does, tries to speak with the driver about his job, his family... He has the flag of the Spanish football team on top of his dashboard. It is true there can be no national team in a country that doesn’t exist...Hanging from the rear-view mirror: the unescapable prayer beads and hands of Fatima against the evil eye, pictures of his children and an olive wood sculpture. Hey, it is a star within the Crib inside! Anne-Claire asks him, are you Christian? No, Muslim. This is a gift I got from a passenger: «TeHebbehâ? (you like it?) » Anne-Claire says she does... and gets it. A present you can’t turn down. 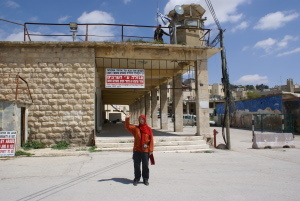 Our two taxis drop us on the outskirts of the town of Hebron, a few meters away from the university and from the premises of the Arabo-Hebronite association Chantal Abu-Eisheh has created. Through her, Tanguy has arranged a meeting for us with a guide from the Association Hébron-France. Her name is Mara’an. She tells us that she’ll spend the day with us and show us round the city. She speaks really good French! We follow her down to the building that shelters offices of the Comité de Réhabilitation de la vieille ville, where we are expected. It is in the old part of the town, a district where a certain number of streets and houses have been repaired with much care and in the respect of ancient techniques. Peace and quietness emanates from the sun-kissed white and oatmeal stones. “Throughout history, there have been periods with a Jewish minority living side by side with a Muslim majority in Hebron. End of the first document. The director of the Committee apologizes. He can see we are not in the ideal conditions to get so much information: standing or sitting on one another’s knees, and (poor Laurie !) everything is in English. Fortunately, Margot and Anne-Claire have taken down notes: we’ll be able to ask them later. The second film focuses on the everyday life of the Palestinians inhabitants. It reveals an incredibly shocking reality and we wonder how these families manage to put up with all they have to endure. Where do the Palestinians find the strength to stay in their house, in their district with the daily harassment and the ban on moving and driving around they are subjected to, the omnipresent soldiers and policemen, all at the settlers’service – even though they are the ones verbal and physical attacks are aimed at? Above all, we are staggered by the settlers’violence, including (and this really shatters us) by that of their children. .
As an answer to our questions, the director gives us examples of situations the Palestinians have to face regularly: settlers launching an attack on one of the Palestinian districts and throwing stones at the houses. It is hard to believe that the soldiers and policemen see to it that all the inhabitants of Hebron enjoy the same rights, or that they protect everyone indiscriminately. Our feeling is that, together with the settlers, they work (at a minimum) at maintaining the inequities of occupation: settlers attack Palestinian civilians, soldiers protect the attackers and the police arrest the Palestinians even though they are the victims... The aim is making their life so unbearable that they will have no other choice than leave. A collaborator knocks at the door: the director is wanted. We stand up and thank him for his time and welcome. He suggests we went up onto the roof of the house before going in the streets of the old town. A white-stone staircase leads us to a first terrasse, then another one up to the roof. We slip between domes specked with round window-panes (fairy-tale effect from the inside!) and rainwater tanks. View on the old town... Mara’an, our young Palestinian guide, points at buildings that are examples of the magnificent architectural past of the old town of Hebron: Ottoman buildings, Mamalouk-style houses with their typical pink, yellow and white stones. She draws our attention on the Jewish and Arab cemeteries lying side by side, then on the control cameras : there are tens military posts and dozens of CCTV inside the old town, she tells us. Israeli flags too. Mara’an says they are on Palestinian houses that settlers have taken over. This is the way they mark their territory. 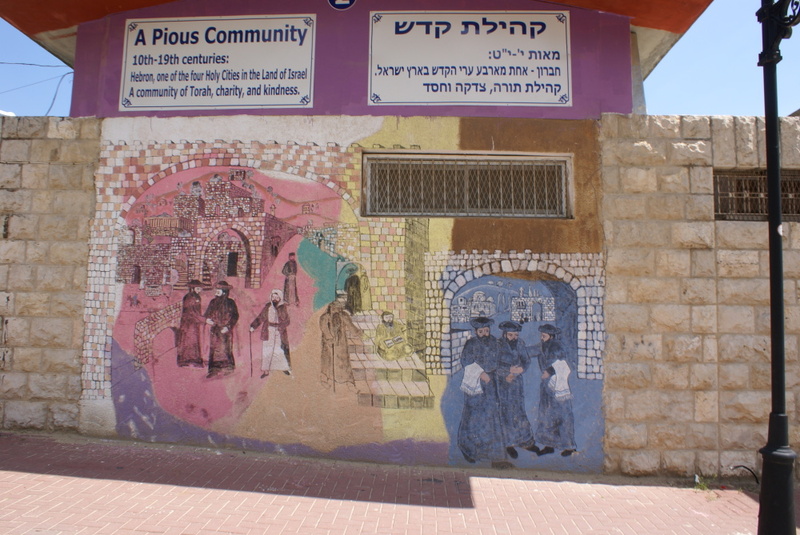 Tanguy, who has read a lot, asks Mara’an if she can confirm the information that the settlers living in the heart of the town are the most ideological in the Jewish population of the West Bank. Mara’an answers that it is probably the case. On our way down, Mara’an answers all our questions about the arrival of the first Jewish settlers into the town after the Six-Day War. In Avril 1968, rabbi Levinger rented rooms in a hotel in Hebron in order to hold Passover Seder with one hundred of other people and then they refused to leave. In a deal with the Israeli government, Levinger moved with his family and followers to a former army base just northeast of Hebron. 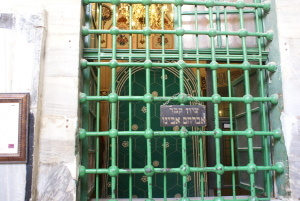 His aim was to set foot in Hebron again, which religious Jews consider as the second holy city after Jerusalem. Tanguy comments: this is their strategy, creating facts on the ground, a method all the supporters of the colonisation of the West Bank resort to. Mara’an goes on: “In 1970, the Israeli government gave the green light to the building of the settlement of Kyriat Arba, just next to Hebron . In the meantime, Rabbi Levinger got permission to settle in the former Jewish district of the town, right in the middle of the Palestinian population”. “ “Yes, the Committee for the Rehabilitation of the Old Town of He (CRVVH) has done a great jobl. 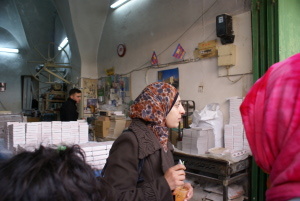 They have rebuilt many houses and little by little, Palestinians come back and live in the old centre. But, there are places where it is forbidden, where we can’t renovate the damaged houses. For example, those opening on the Martyr Street, i.e. 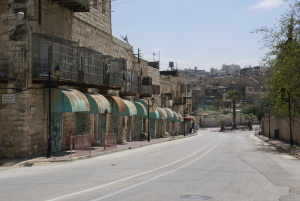 the street that divides Hebron into two: it is at the settlers’exclusive use.”” . The Palestinians smile at us and greet us with an ahlan wa sahlan fi filistin ! ("welcome in Palestine"), even if we shake our heads in front of the goods they invite us to have a look at. No harrassing on their part, no begging either: if we buy something, it’s fine. If we don’t, we are all the same welcome. Yet, we surrender in front of a man who sells fresh fruit juice- orange, carrot, lemon: it is so hot and the mixtures look delicious! We also buy boxes of Turkish delights for our families. The whole group lines up together again. We follow Mara’an up to the limits of Zone H2. She stops a few meters away from the checkpoint : she is not allowed to go in. We hesitate: shall we stay with her in solidarity? But, as Tanguy says we must have seen this district from the inside if we want to be able to talk about it. So, we walk past the soldier in charge (do they never put down their assault rifles?) 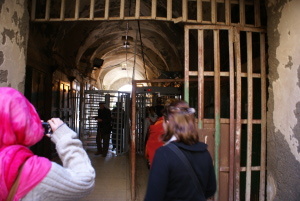 and enter Martyr Street, which links two of the Jewish settlements to each other. It is completely deserted: not a cat, not a living soul, except at the guardposts. On the right and on the left, the street is lined up with light green iron shutters: closed shops. Weeds have invaded the pavements on which nobody walks anymore and start mounting an assault on the walls of the buildings. As we get closer, we notice that the shutters have been iron-welded, most probably by the soldiers who closed the shops. 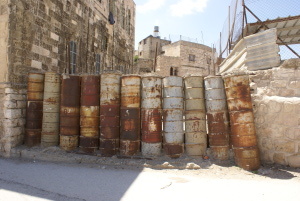 The perpendicular streets are all closed off either by two-to-three-meter high concrete wall sections fitted together (of the same type as those used to build the separation wall), or by rusty oil drums piled up on one another. 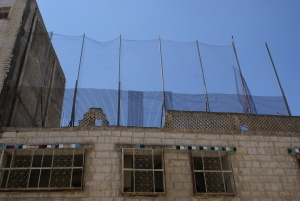 Palestinians live there, behind these barriers, and are not allowed to walk nor cross Martyr Street: the doors and windows facing it were sealed up and the inhabitants have had to find other ways to go out of their house. We move forward in silence. Everywhere, barbed wire, blocks of concrete and, tagged with spray-cans, the Star of David and calls to hatred in Arab, Hebrew and English - "Gas the Arabs!..." On the balcony of a house, clothes are drying. This is the only sign that the place is not entirely deserted. But what a sad life it is for the Palestinians whose house found themselves on the “wrong side”, once the partition of the city in two zones was (arbitrarily) decided... Hiding at the faintest sound of boots or stampede: soldiers and settlers often come and go there. Our steps resound in the empty and silent space. Here and there, Israeli flags, soldiers on the roofs and surveillance cameras everywhere. A notice board left on the floor informs us that“these buildings were constructed on land purchased by the Hebron Jewish community in 1807.” In bigger letters, white out of red, it says that "this land was stolen by Arabs following the murder of 67 Jews of Hebron in 1929". Then, red letters out of white: "We demand justice! Return our property to us!" 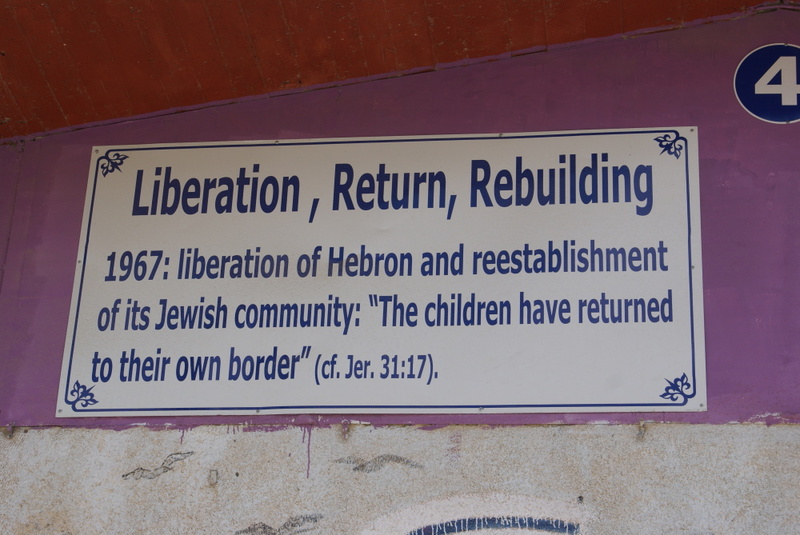 Signed: "the Jewish la community of Hebron". Painting 1 :"Roots of the Jewish people. Biblical era. 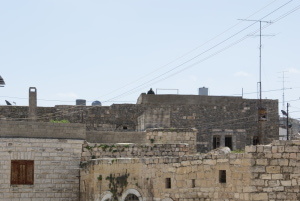 Hebron, city of the Patriarchs and Matriarchs, capital of Judea and site of the birth of David’s reign." - Painting 2: "A pious community: 10th-19th centuries. 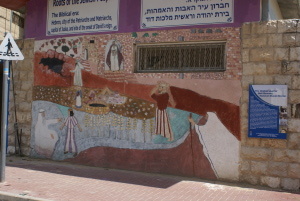 Hebron, one of the four holy cities in the Land of Israel. A community of Torah, charity and kindness" – Painting 3 : "Destruction. 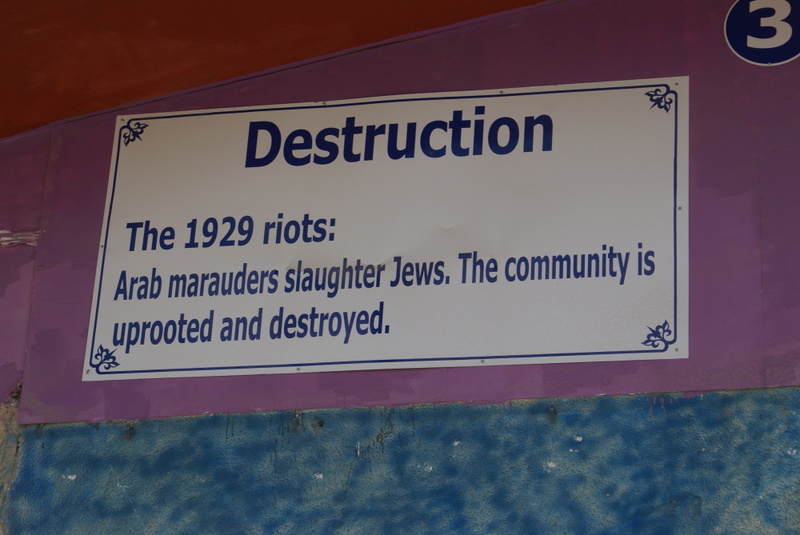 The 1929 riots: Arab marauders slaughter Jews. The community is uprooted and destroyed." - Painting 4 : "Liberation, Return, rebuilding: 1967, liberation of Hebron and re-establishment od its Jewish community. "The children have returned to their own borders -Jeremy, 31-7""... In the cracks of the empty houses, wild grass and scrubs are growing... Laurie asks: how can I know if a house is still inhabited by Palestiniens or not? It is simple: if there are water tanks on the roof, be sure they are. We have now got close to the Talmudic school. On the roofs around, soldiers are standing guard. They watch us from above, their rifle in their hands. From behind a wall, children’s voices and cries come to us. So, there are indeed settlers living here? 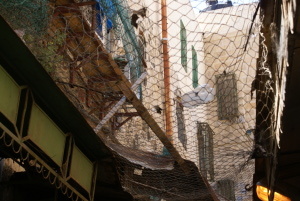 Their houses, all covered with wire, are grouped together and open on the shopping street parallel to Martyr Street. We really wonder: how can you decide to settle in a place that had the wind taken out of its sails, whose life and inhabitants were scared away? How can you dream of living in there, of starting a family?... This place in so unreal. You would think you are in a ghost town of the Far West, or in a disused film or theatre set... We take pictures. Where are the children, the shopkeepers’ calls, people’s laughters?... What have the settlers done to this town? Suddenly, a few meters away, we see two women wearing trousers and an armband walking towards us. 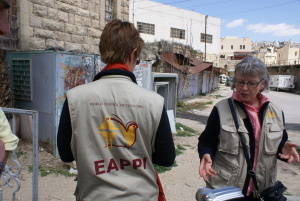 They are foreigners (German or Swedish) and members of the EAPPI, an association of international civilian volunteers who ensure a presence in the sensitive areas of the West Bank, as the centre of Hebron is, so as to prevent clashes between Palestinians and Israeli settlers as much as possible. They tell us a bit about what their job consists in. 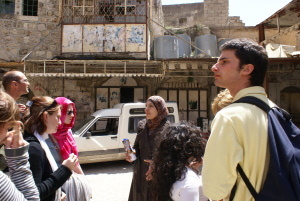 The civilian observer mission in Hebron started in 1997. It was called for by the Israeli and the Palestinian authorities to support them in their efforts to improve the situation in the city. By their presence they should promote a feeling of security to the Palestinians of Hebron and help stability in the city. The TIPH reports on breaches of international humanitarian law and international human rights standards. The parties (the Israeli Defence Forces or to the Palestinian Police Forces) are obliged to give an official response to the inquiries submitted by the EAPPI or TIPH, all with the aim to find remedies and solutions to the reported incident. It’s time we went back now and meet Mara’an again. There she is, waiting for us patiently behind the Nadar barriers, under the unblinking look of the soldiers. We move away from this gloomy place as quickly as possible. In a few minutes’time, we are back in H1, in the middle of the Palestinian district and the oppression we felt in H2 fades away slowly. Mara’an takes us to Hebron archaelogical museum, which has a collection of artefacts from the Canaanite to the Islamic periods. 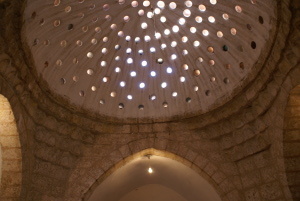 It used to be a hammam as some characteristical traits indicate: domes in the ceiling specked with round window-panes that let rays of subdued light in, stone basins, taps. After the visit, we leave a short message in the museum gold book and follow Mara’an through the maze of the old quarter. 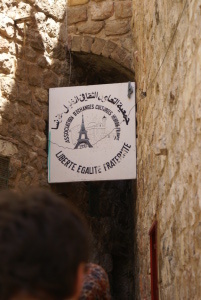 All of a sudden, just above our heads, there is a sign written in French that says: "Hebron-France cultural exchange association”. Across it, there is a picture of the Eiffel tower and Al-Aqsa Mosque entwined, and the French motto "Liberté, Egalité, Fraternité ". Waouw! That was unexpected! And a reason for our French Marie-Gaelle to feel proud! We are in fact standing in front of the building where the first Hebron-France cultural centre used to be. 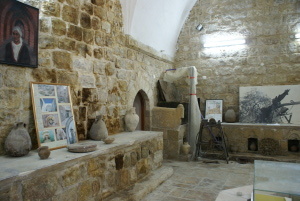 The Taayoush Group visited it in 2009. 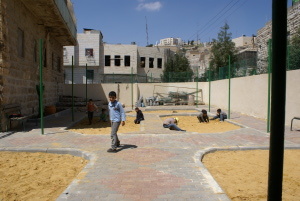 Since then, the playground has been enlarged as well as the sandbox and the centre can accommodate more children. 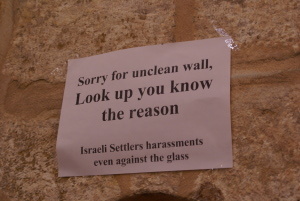 Yet there is still some danger and the ground is protected by a wall and a fence which the children are told to stay away from as settlers sometimes take pleasure in firing from the terrasses situated a few meters away. There are “only” 500 of them, but they are under the protection of 2000 Israeli soldiers. This probably explains their feeling of total impunity. Raising our eyes towards the hills that surrounbd the town, we see the separating wall and its watch-towers. It is impossible to forget about it: it is never very far away... We take pictures of the children who are playing and smiling at us. They come to speak to us without any hangups, then follow the leaders into the building for the activities. Vaulted ceilings, arched doors, ancient architecture: it is so peaceful in there. We are welcomed with a nice glass of tea, then the counsellort tells us about their new centre: they got the house after the Association Hébron-France had moved to its new premises near the university. 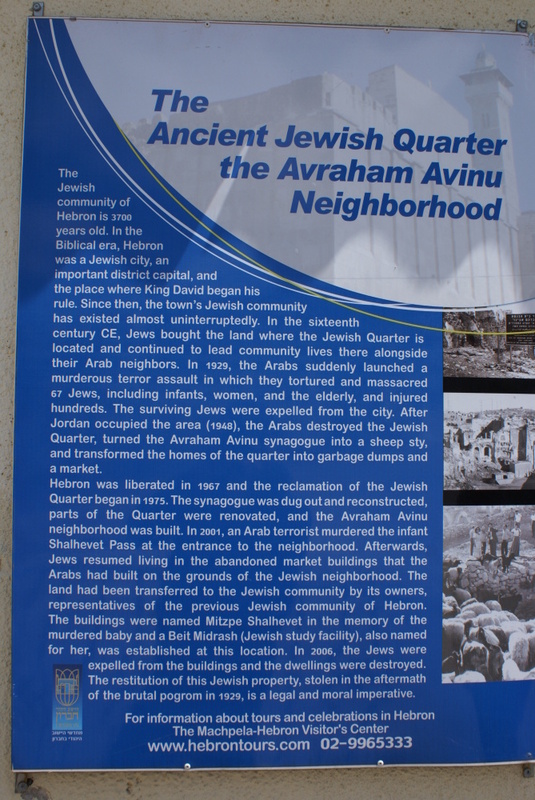 They had had to close the first centre because of the numerous settler attacks on it. 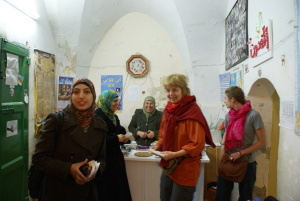 In this place extra-curricular activities are organized for the children aged 6 to 15 who live in the old city of Hebron. All of them have problems, the young woman tells us, either at school or with their parents or because life in the streets is dangerous and traumatizing. The centre is the only place they can come to to play or read and every saturday, around 500 chidren join the activities organised here. The centre has a library now, with books in Arab, English and French, and a room with different educational games. Two social workers work here as well as retired teachers who help the children who have learning difficulties in Maths or in English. There are also Music lessons , three summer camps (theatre, music, dabkeh: one for boys only, one for girls only, one coeducational). Besides, the European Union supports activities aiming at the preservation of the environment and heritage (gardening, plantation of vines) as well as the playground. Before we go back to the Association d’échanges culturels Hébron-France where we are meeting Chantal Abu-Eisheih, we want to treat Mara’an to a meal and ask her to take us to a nice place where we could taste traditional dishes. 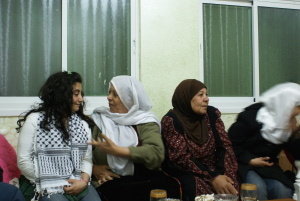 A great opportunity to speak with her about her family, her academic background and the economic situation in Palestine. We are now back in the premises of the France-Hebron association. Another glass of tea and Chantal tells us how she came to live here. She is French and she met her husband Anouar Abu-Eisheih in Paris in 1970 (she was 20 then). She fell in love with this Palestinian who had been expelled from his native town. After the Oslo Agreements (1993), they could go back to Palestine with their two children (aged 1 and 4 at that time). Her husband worked as a taxidriver for three years, then as a university professor in Jerusalem. 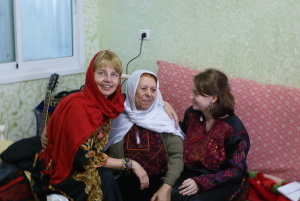 In 1997, Chantal and her husband decided to create an association in support of the Palestinians of Hebron and to promote contacts between Hebron and France. They started organizing French classes, first in private houses, then in the cultural centre we have just visited in the old town, and finally in the place where we are now. Things didn’t always go like clockwork: with the 2000-2005 intifada and curfew, many teachers had administrative problems with the Israeli authorities and couldn’t come and teach. In 2002, Chantal got fed up with playing hide-and-seek with them and declared that either they would stop it all and leave Hebron or give themselves the means to succeed in their project. Thanks to bonuses, donations and the help of the French Consulate, there are at present ten full-time salaried employees , Chantal explains, next to herself and her husband who are both volunteers. “This place is one of the few mixed places that exist in the town. The society here is still very traditional: the eldest in the family has a different status, the authority on his brothers and sisters, etc. This probably explains why 70% of the students are girls: they learn French in the hope to be able to leave and continue their studies in France, a way to escape the family supervision”. When we ask her about her own children, Chantal answers that her daughter is studying medicine in Jerusalem. She wants to work in Palestine. Her brother, aged 16, feels as much Palestinian as French though he admits that living here as a teenager can sometimes be quite frustrating - seeing the few opportunities there are to do sports and other leasure activities. Chantal also tells us that her daughter wears the hijab because (and she quotes her daughter) she wants “to be coherent” with her surrounding. Only one girl out of ten don’t wear it here. She feels Muslim by culture because for her (quote) “the basic principles are the same in all three monotheistic religions.” Chantal says she has no regret, even if sometimes she misses her family (and mussels and French fries! ): the encounters she has here are so much more interesting and gratifying than in France. Chantal teases us saying that the Hebronites are sort of “the Belgians of Palestine”: compared to the inhabitants of Nablus, for example, they have a special accent, a bit drawling, and particular idions. When we ask her about the possibility of a third intifada, Chantal answers that it it not going to happen before a certain time: “The two preceding intifadas have left many psychological injuries, which can still be felt in the population. What is more, the people are slowly but surely moving towards something that is typical of neoliberal economy: “everyman for himself,” and pleasure at all costs. They want to "make the most of it", go on holiday… Not to fight for a cause anymore.” Yes, we kow what she means. We have met one of them in Al-Arroub: Bassam. We leave Chantal and promise to send her a copy of the book “Beautiful Resistance” the first Taayoush Group wrote after their 2009 travel in Palestine. We thank and congratulate the glass-blower, go into the shop. There are hundreds of items there, functional or decorative : cups, bottles, bowls, jugs, dishes, olive oil or petrol lamps, glass beads for jewellery, blue and green ones or glass beads with eyes (“owayneh”) that are supposed to be effective against the evil eye, beads of small hands (representing the hand of Fatimah, the daughter of the prophet Muhammad)… All in colourful glass, the one more beautiful, more refined than the other, catching and playing with the light…. What a wonderful sight! 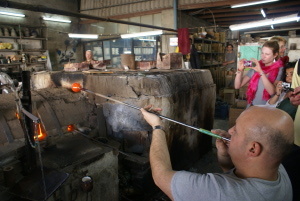 We understand why Hebron glass continues to serve as a tourist attraction in spite of all the restrictions the glass-blowers are subjected to. Of course, we buy presents for our friends and families, hoping they won’t be broken in the transports. It is only a pity we don’t have enough time to go and visit the worshops where ceramic is hand-painted and where keffieh are woven. Next time, we will. 6.20 p.m.: through the half-opened windows of our living/eating room, we hear noises that eventually start intriguing us. These are not the usual calls of the kids playing together or chasing one another on the street. Something else is going on. As all our windows are barred and wired, we can’t lean on to try to get a better view on the outside. Going onto the terrasse is no use either as it opens on the back of the neighbouring houses and of the Girls’ schoo. We open the main door of the flat: obviously there is trouble. In front of us, the street is empty but a bit further down, in the main street of the camp where the shops are and where Sarah and Tareq live, there is some upheaval. We can hear noises of objects being thrown, like gravels against metal plates, and voices calling out, shouting orders, warning, challenging, chanting slogans. We hear shooting too: rubber or real bullets that kill? We don’t venture to go out: we have no idea of what we would find ourselves in. Suddenly, kids and teenagers come up our street running: they keep throwing glances behind their back, checking if they are being followed, then stop and run back down the street, up again, trying to hide from somebody or something, then down again, all together as one man… They must be aged 12 to 15... The exclamations are getting louder, young voices are booing, men’s voices answer back sharply in Hebrew and Arabic: Jewish soldiers. Other noises still, which we can’t identify. A woman speaks close to us, her voice is trembling. From one of the windows of the building in front, somebody waves towards us : get back in and shut the door behind you! But we want to see and understand what’s going on. Yet, right at that moment, a projectile thrown from nowhere lands just on our feet: a stone. We immediately shut the door just before other stones crash on it. Now we know why there are bars and wires on all the windows and doors. But it is impossible not to save any record of what is going on: Anne-Claire opens the little door-window partway while Tanguy records the sounds and noises that reach us and Sébastien takes pictures on the sly. 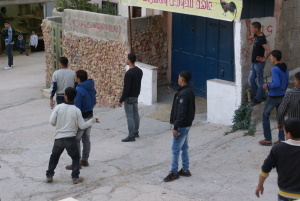 A weird scene unfolds before our eyes: young teenagers are looking toward the end of the street, some are picking up stones, others are already ready to throw theirs or to clearoff, depending on what comes next. Others are only watching the scene, their hands in their pockets or on their hips. But they are ready to run away too, if necessary. At the wired windows of the upper floors of the neighbouring flats, there are women and younger children, watching like from a theatre gallery. All of a sudden, one of the youths sees us and waves towards us “No! No pictures!” He looks threatening, acts as if he was going to hurl a stone at us but we wave back: Ok, don’t be afraid of us, we are not going to take pictures anymore, we are on your side. The pictures are only to testify in Belgium, to show the people there what the inhabitants are subjected to here. Then, in the blink of an eye, everything is calm and back to normal. The soldiers must have left the camp, the children have gone back home for supper. Sudden bangs on the door. We throw petrifid glances at each other: what is this now? But we hear Youssef calling out : open the door, it is us!... Oh yes, indeed! We were having visitors tonight! We had almost forgotten about it with all this hubbub! Youssef comes in, carrying his young son on his arms. He is followed by his mother and his brother Noah who are both carrying a big plate covered with a white cloth. She baked two wonderful cakes for us! Anne-Claire is of course speaking with Tareq, whom she fondly calls “my second Palestinian son". Who is the first one? Daoud is, of course! As they are both the same age as her own sons, she has adopted them !. The men have gone out on the terrasse where they can smoke and where they tell Tanguy about the relationships between the Iraelis and the Palestinians. The only thing they want is peace. They hope their children and grand-children will one day be able to go back to their villages. For them, the camp is only the camp and having to live in it can only be a temporary situation. They tell us where they are from: Jaffa, Haifa, but also small villages that are now Jewish settlements. We listen to them. What they say is strange to us: the fact they feel they are living just for a while in a place (in this case Al-Arroub camp), while actually they were born in it and will most probably die in it… Of course, we don’t tell them. For more details on these "facts on the ground", see for example the documents and maps of the association Americans for Peace Now. On the recent history of Hebron and the present situation, watch ARTE documentary "Hébron : le chemin de la paix" (février 2011). For some times, things have been changing: the Israeli government works at establishing Jewish settlements inside East-Jerusalem too : see information given by Daoud, for example. The Six-Day war was fought between June 5 and 10, 1967 by Israel and the neighbouring states of Egypt, Jordan, Syria and Irak. The war began with Israel launching surprise air strikes againt Arab forces, a « preemptive attack » in answer to the Egyptian blockade in Tiran Strait against the Israeli ships on Mai 23 1967 (the Israeli had first declared they considered this act as a casus belli). Tsahal’s tanks jostld their adversaries on all fronts. In less than one week, the Hebrew state tripled its surface as it took effective control of the Gaza Strip and the Sinai Peninsula from Egypt, the West Bank and East-Jerusalem from Jordan, and the Golan Heights from Syria. in other words, the mutual recognition of Israel and of the PLO, the creation of the Palestinian Authority (PA) and the withdrawal of the « Israeli Defence Forces» ( IDF, the Israeli army) from certain Palestinian cities. To gain a sense of the extent of this violence, see for example the documentaries "Welcome to Hebron" (Press TV, Decembre 2010) and "Hébron, ville symbole de la colonisation israélienne" (France 24, juillet 2008). On this subject, read the testimonies of former Israeli soldiers collected by the Israeli organisation Breaking the Silence. 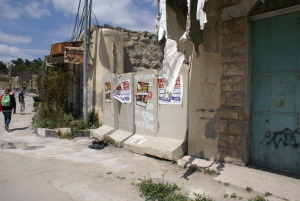 As an example, read the article "Des colons agressent des enfants palestiniens à Hebron" (Alternative Information Center, avril 2011). About this closure, see La Belle Résistance. According to the Yesha Council (acronym for Judea-Samaria and Gaza in Hebre), 30% of the settlers are ultra-orthodox people, 30% lay people and 40% religious people or traditionalists. 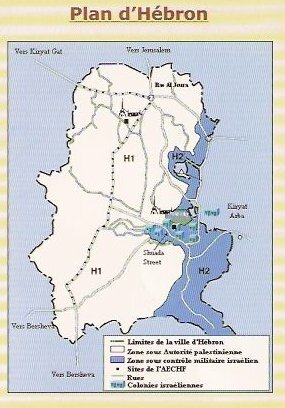 In 2007 ACRI (Association for the Civil Rights in Israel) and B’tselem (Israeli Information Center for the Human Rights in the Occupied Territories) published a report on the closure of Zone H2 to the Palestinians and on the number of Palestinians who have left since then. 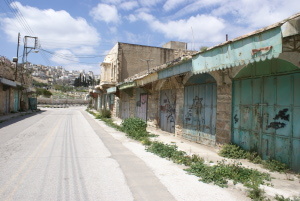 In this part of the town, several streets are barred to the Palestinian residents who are forbidden to move around or to have their busines/shops there. .
 Kiryat Arba settlements had more than 8000 inhabitants in 2010. 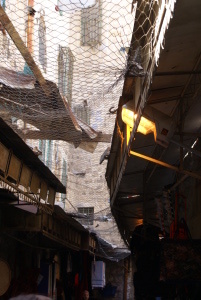 Only the settlers can use a car there; a narrow passage was recently built along part of the street for the Palestinian pedestrians of the quarter. 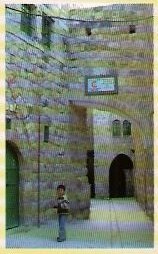 The building was divided into two in the aftermaths of the murder of 29 Palestinians during the prayer by a fanatical Zionist settler called Baruch Goldstein in 1994. Read the testimonies of former Israeli soldiers who served in Hebron between 2005 and 2007. Pot to cook the foukhara, one of the specialities of Hebron: dish made of a mixture of vegetable, meat and spices braised in the oven. 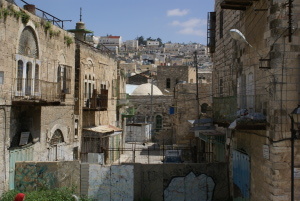 See more photos of the old town of Hebron. See the T Press documentary "Welcome to Hebron". See also the musical project Al-Kamandjâti.